Have you ever watched a weigh in at a big tournament and thought how awesome it would be to actually be the one on the stage having your fish weighed. I've been there, and this past weekend I had the opportunity to experience it. Petawawa, Ontario was the host town for the 2011 Ontario B.A.S.S. Championship. 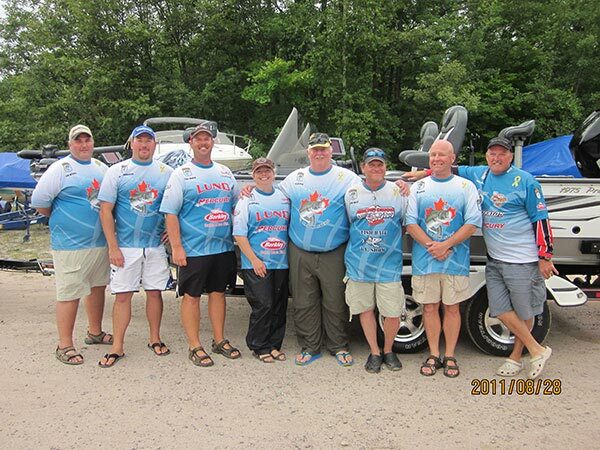 As a member of the Ottawa Valley South Bass Masters (OVSB) it was a pleasure to be part of the team representing our chapter. After the Friday meeting I went for a ride to find the launch area. The launch was on Canadian Forces Base Petawawa. I went the wrong way and ended up in an area of the base that was forbidden. Security greeted me and informed me that I was in an active area. I am not exactly sure what that meant, but the big white sign that said WHAT YOU SEE AND HEAR STAYS HERE was a good indication that I wasn't supposed to be there. Security was friendly and gave me the directions to the launch. Before I drove away I asked if I would be shot at while I was driving back out. Security laughed and said not to worry, you never know what kind of exercises could be going on. Day one didn't start the way I wanted to. I thought I was getting to the launch early. I arrived about an hour early, but that was late considering the amount of boats that were launching. Boaters and non boaters met in a parking lot that was maybe a half mile away from the launch. Once the stuff was loaded we drove down a stretch of hill to the launch. After waiting in line, we get the boat in the water. Then the boater waits with the boat while the non boater drives the truck and trailer up the hill to the parking lot. Then you have to wait to get the shuttle back down the hill to get in the boat. I wasn't expecting that kind of launch, we were supposed to blast off as boat seventeen but we ended up almost last. My boater Vic Capobianco from the York Bass Masters, was very understanding and made the best of my mistake. I felt terrible about the whole situation. I learned a very good tournament lesson. Know how many boats are blasting off and adjust your arrival time accordingly. Once in the boat Vic headed out to a spot he found in the pre-fish. A good spot it was, Vic had five fish in the live well with in the first twenty five minutes of fishing. I managed to pick up two Smallies of my own. Vic culled out some fish through out the day, I just couldn't get things going. Two fish would be all I weigh in. Some what of a disappointment, but it was a pleasure to fish with Vic. Vic and myself at the weigh in. Fellow OVSB angler Julie Charron Landed a beauty Small Mouth on day one. Day two started much better, I was plenty early for the launch. My boater was Doug Catton from the Petawawa Bass Masters. Waiting to blast off. It was very windy and it was going to be a challenge on the river this day. Boater and president of the OSVB Tim Baker. With the heavy winds and the fact that it would take a miracle to make team Canada, Doug suggested we go fish behind an island out of the wind. It turned out to be a pretty good spot. I managed to land four Small Mouth and I lost my fifth at the boat. Doug managed to land three Small Mouth. Not far from the area we were fishing was the white buoy out of bound marker. We were allowed to cast into the area, but couldn't cross the area past the buoy. The white sign on the shore was a warning sign, that was part of the military base. Doug was telling me how the military did testing and there was a possibility there could still be some explosives in the water. We fished that one area the whole day and we could hear machine guns through out the day. Since we weren't in the running I shot a quick video. I had a good day on the water and enjoyed the fishing and conversation with Doug. A couple good finishes from the OVSB. Frank Ramsay finished 15th, less than one pound away from qualifying for team Canada. Julie Charron finished 24th, less than two pounds from qualifying for team Canada. Congrats to Julie and Frank, on an excellent finish. As for me I finished 85 out of 105, not a great outing from a fishing stand point, but for my first big tournament I am satisfied with that. The whole weekend was an experience I won't forget. I am going to take what I learned from this weekend and use it to improve for next year's championship near Linsdsay, Ontario.